Donations of $2 or over are tax deductible. We appreciate your support to provide hope for brain injury. Hi, my name is Dylan and I am 14 years old. I have cerebral palsy. This means that I have a brain injury that affects how I control my body. I need help to do things for myself and some things have to be done for me. 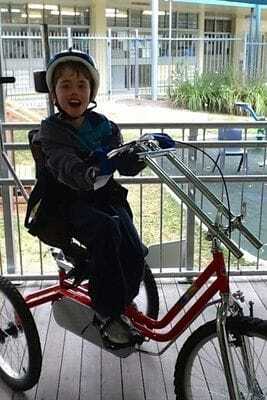 I am practising using my motorised wheel chair and gaining more independence and skills everyday. Everything I do takes time and lots of practice. I am practising using eye gaze technology and walking in my frame at high school. I have just walked to our local shop 1.3k in my walking frame. Now my therapist is going to help me to reach a goal of using a three wheel scooter. Donate online by clicking the "Make a Donation" button above. Send this page to all your family and friends. Any donations of $2 or over are tax deductible. We thank you all for your love and support of our beautiful son. If you have any enquiries please contact Mark and Louise personally at louise.mark@optusnet.com.au or Louise on 0423 968 112. I can say a clear "yer" and other words at times but sometimes speaking is too hard, so I use lots of different ways of communicating. I spell out words on an alphabet board. I need help to steady my hand to do this. I also use buttons with taped messages. My best way of talking is using a speaking machine and activating it with my eye gaze. I have to stay very still which is tricky for me. I am trialing devices and learning a new system of forming complex language. I also work really hard with my conductive education therapists and practice sitting and standing and walking. I have had surgery to fix my hips and am now getting back to standing and strengthening and holding myself up. I am very busy and this takes a lot of effort and time but I love getting stronger and being helped to do as much for myself as possible. Dylan our oldest, and much loved son, was born in 2001 and sustained a brain injury which resulted in athetoid cerebral palsy. Our vision for Dylan to be happy, healthy and able to live life to the fullest has carried us all through many changes, much learning and growth; physical, emotional and spiritual. For the past seven years, through sheer determination and love of life, Dylan has attended our local state school and now he is preparing for highschool with the same energy and enthusiasm. He is a loving, intelligent boy who loves socialising with his friends and family, doing science experiments, playing percussion, going to art classes and the beach, swimming, telling jokes and playing in our back yard with his brother Harry, our dog Biscuit and several chooks. Riverwalk is the annual fundraising event organised by The Developing Foundation to enable us to fundraise for our own child. 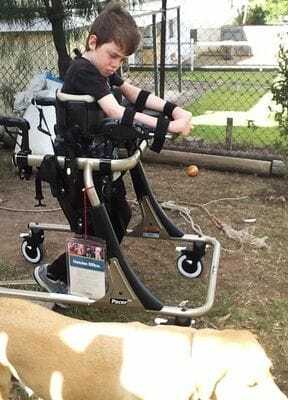 Fundraising allows us the flexibility to choose the therapies and equipment that work best for Dylan, promoting inclusion in the able bodied world. Can't wait to see you on the three wheel scooter Dylan! Well done, Dylan. You look great in the photograph with Therese and Stuart. Congratulations - You made it to the end Dylan!! I'm sure you will continue to improve your mobility Dylan with therapy and patience. You are awesome Dylan! Here is to the next step to freedom and independence!! Hope you reach, or even better exceed, your target Dylan.